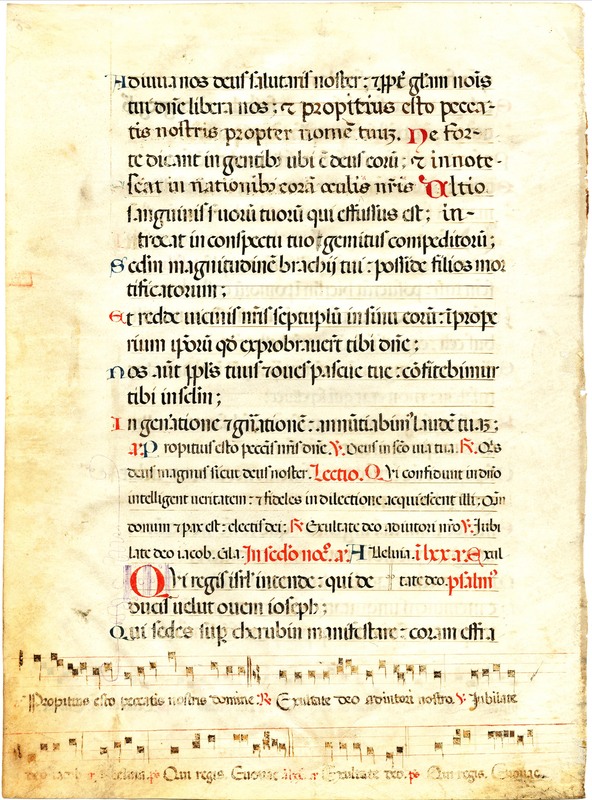 Text: Psalms 77:69-78:8 (recto); Psalms 78:9-79:3 (verso). Páscere Jacob servum suum, et Israël hæreditátem suam. 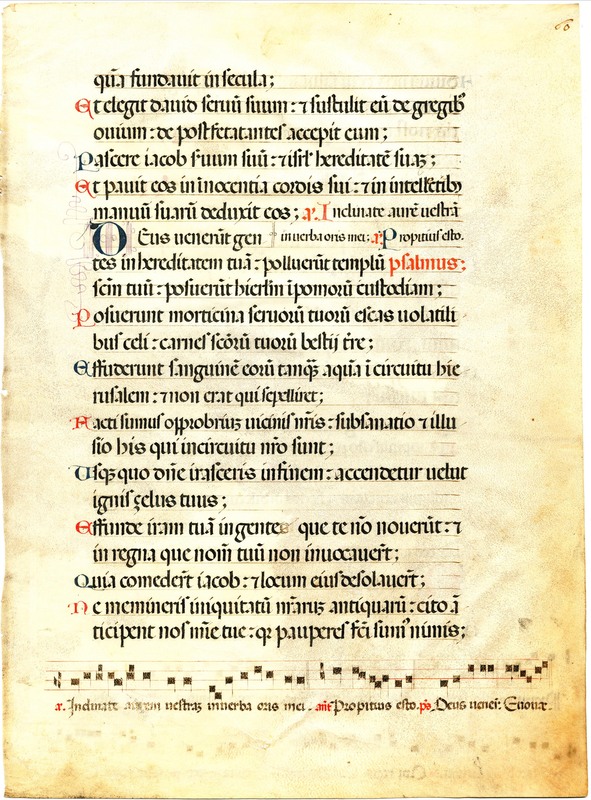 Et pavit eos in innocéntia cordis sui, et in intelléctibus mánuum suárum dedúxit eos. Ant. [ ] Psalmus. Deus, venérunt gentes in hæreditátem tuam; polluérunt templum sanctum tuum; posuérunt Jerúsalem in pomórum custódiam. Posuérunt morticína servórum tuórum escas volatílibus cæli; carnes sanctórum tuórum béstiis terræ. Effudérunt sánguinem eórum tamquam aquam in circúitu Jerúsalem, et non erat qui sepelíret. Facti sumus oppróbrium vicínis nostris; subsannátio et illúsio his qui in circúitu nostro sunt. Úsquequo, Dómine, irásceris in finem? accendétur velut ignis zelus tuus? Quia comedérunt Jacob, et locum ejus desolavérunt. Ne memíneris iniquitátum nostrárum antiquárum; cito antícipent nos misericórdiæ tuæ, quia páuperes facti sumus nimis. ...which he founded for ever. 70 And he chose his servant David, and took him from the flocks of sheep: he brought him from following the ewes great with young, 71 To feed Jacob his servant, and Israel his inheritance. 72 And he fed them in the innocence of his heart: and conducted them by the skilfulness of his hands. Ant: [ ]. Psalm. O God, the heathens are come into thy inheritance, they have defiled thy holy temple: they have made Jerusalem as a place to keep fruit. 2 They have given the dead bodies of thy servants to be meat for the fowls of the air: the flesh of thy saints for the beasts of the earth. 3 They have poured out their blood as water, round about Jerusalem and there was none to bury them. 4 We are become a reproach to our neighbours: a scorn and derision to them that are round about us. 5 How long, O Lord, wilt thou be angry for ever: shall thy zeal be kindled like a fire? 6 Pour out thy wrath upon the nations that have not known thee: and upon the kingdoms that have not called upon thy name. 7 Because they have devoured Jacob; and have laid waste his place. 8 Remember not our former iniquities: let thy mercies speedily prevent us, for we are become exceeding poor. Et redde vicínis nostris séptuplum in sinu eórum; impropérium ipsórum quod exprobravérunt tibi, Dómine. In generatiónem et generatiónem annuntiábimus laudem tuam. Qui regis Israël, inténde; qui dedúcis velut ovem Joseph. 9 Help us, O God, our saviour: and for the glory of thy name, O Lord, deliver us: and forgive us our sins for thy name's sake: 10 Lest they should say among the Gentiles: Where is their God? And let him be made known among the nations before our eyes, By the revenging the blood of thy servants, which hath been shed: 11 let the sighing of the prisoners come in before thee. According to the greatness of thy arm, take possession of the children of them that have been put to death. 12 And render to our neighbours sevenfold in their bosom: the reproach wherewith they have reproached thee, O Lord. 13 But we thy people, and the sheep of thy pasture, will give thanks to thee for ever. We will shew forth thy praise, unto generation and generation.